August | 2013 | Love Those "Hands at Home"
A week or so ago, I began what is a short series by asking, “Why vintage?” What is it about clothing and home décor and cars of decades past that appeals to people? The first reason I discussed was the fashion appeal of vintage design; the second was a sense of ethics and commitment to re-use. Today I’ll talk about impulse to buy and use vintage because of issues of cost and quality. Anyone who’s on the vintage bandwagon will want to regale you with the great deals they have gotten! My mother has been known to usher people around her adorable lakefront cottage, pointing out pretty much every piece of furniture and décor, and naming the price she paid at garage sales! Don’t judge—I bet you’ve done it yourself! It isn’t simply the low cost of the finds that is so appealing, though. You can get inexpensive stuff at the dollar store, too. The key is that vintage can be cheap and excellent while the new stuff at bargain stores, and even some better stores, will be cheap and, well, cheap. You’ve heard your parents and grandparents lament that, “they just don’t make [fill in the blank] like they used to!” And the truth is that, in many, many cases, they don’t. Let’s consider two sorts of places you can buy vintage and what you might find. There are lots of others—I’m just using these as examples. The Internet has completely changed the world of shopping for and collecting vintage items. There was a time when, if we wanted to buy cool vintage clothes or housewares or tools, we had to be committed to slogging through every garage sale, flea market, and thrift shop we came across, just hoping. Now we can simply do a search, as broad or narrow as we like, and find our passion quickly. Finding that special item is manageable now but is it low cost? You can certainly spend a LOT of money on eBay or Etsy. And your purchases may not be the great bargains they could be if you found them at garage sales, as we’ll see soon. But the cost and quality can still beat, by a mile, what you’d find on brand-new products. I used eBay and Etsy as my primary points of reference but there are lots of places to buy online, including Craigslist, of course. In a fairly quick computer search, I found vintage, but unused, pure linen tablecloths for as little $10. 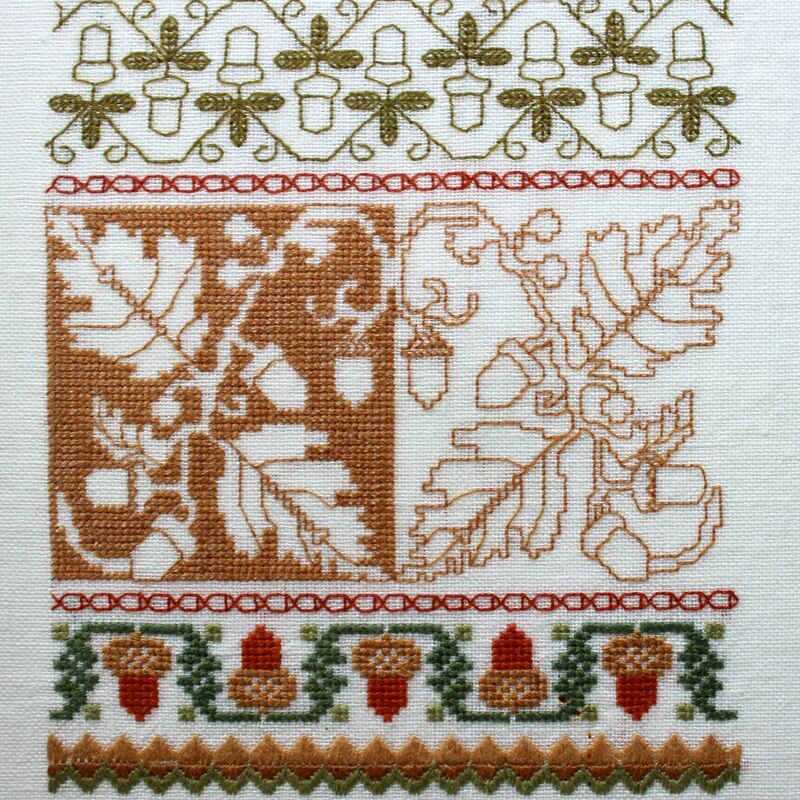 On Etsy, I found a set, again unused, with a vintage Irish linen tablecloth and four napkins for as little as $26. A brand new Irish linen set, in a similar size, from a purveyor of new Irish linens could cost upwards of $200. Similarly, I found tablecloths in sturdy cotton or cotton/linen blends, with cool mid-century designs, for as little as $15. The least expensive brand new tablecloth and napkins set I could find on the J.C. Penney website was $25, for a plain one-color cloth made of polyester! J.C. Penney doesn’t sell any wool blankets. A new wool blanket, for a queen-size bed costs $190 on the L.L. Bean website. A new Pendleton blanket, the most basic model, costs $180. Similar-sized Pendleton blankets can be found on Etsy, in what is asserted to be excellent condition, for as little as $30. Do you like to cook and love that Danish modern look? Dansk has revived the Kobenstyle pans and is selling the new casserole pan for $130. 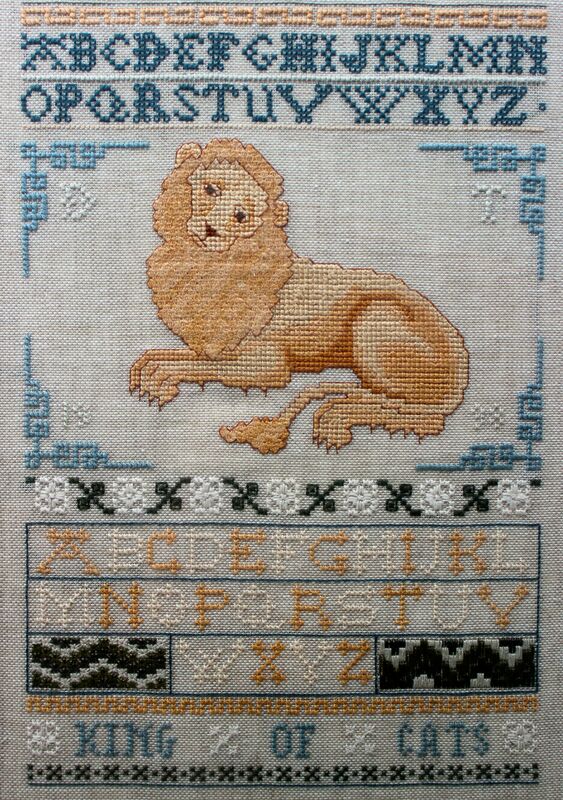 I recently sold a vintage one, in perfect condition, for half that (this is the photo at the top of the post). Like Le Creuset? You could buy a brand new Le Creuset lasagne pan for $130. Right now, on Etsy, you can get a vintage pan, with no issues, for $36. The new 3.5 quart Dutch ovens are selling for $230. 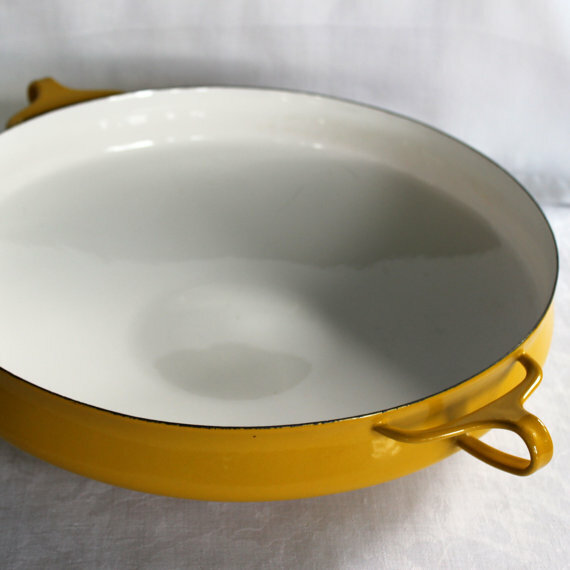 Recent auctions on eBay, for a 4.5 quart vintage Dutch oven, have finished with winning bids as low as $20. I could go on and on. But, really, do I need to? For those with patience and a zest for treasure-hunting, there are huge bargains to be found at flea markets and garage sales. This kind of shopping is not for everyone, of course, but for those of us who love vintage, the “thrill of the hunt” gets us out the door early on the weekends. 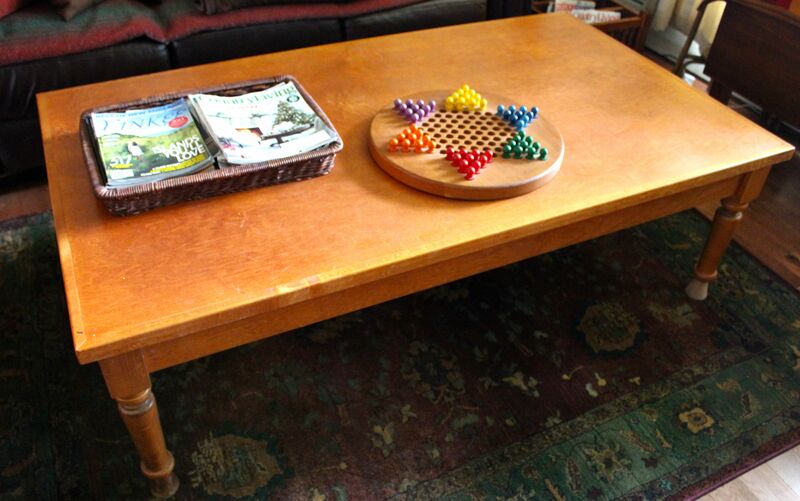 The coffee table, above, is a classic style, huge, heavy, and made of solid wood. It did not need any refinishing and cost $20. 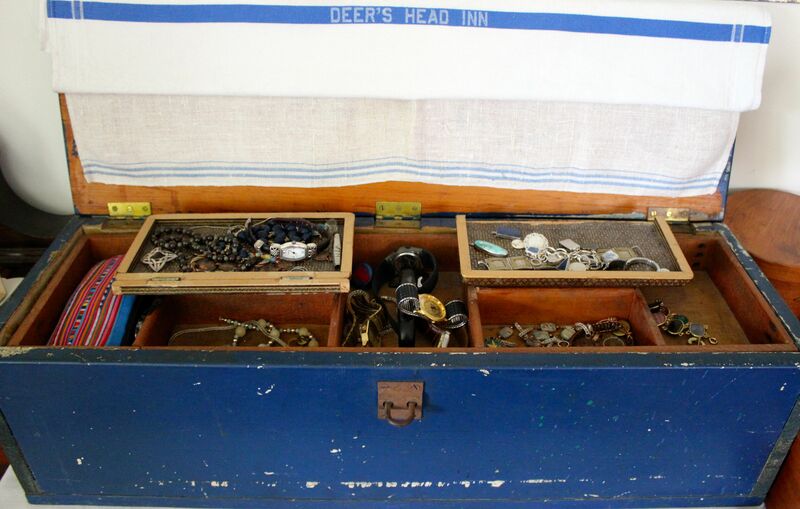 This is an old wooden tool box, with a tray that lifts out. It cost $15 and I use the tray for jewelry storage. I love the blue paint! 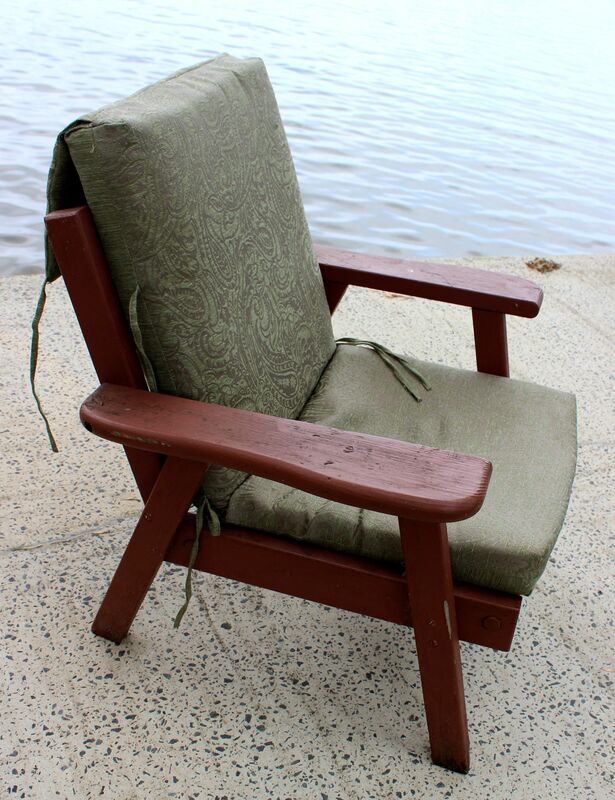 The chair in this photo cost $8, but it needed a new seat. It’s a very nice example of Windsor styling—see how slender the back pieces are? 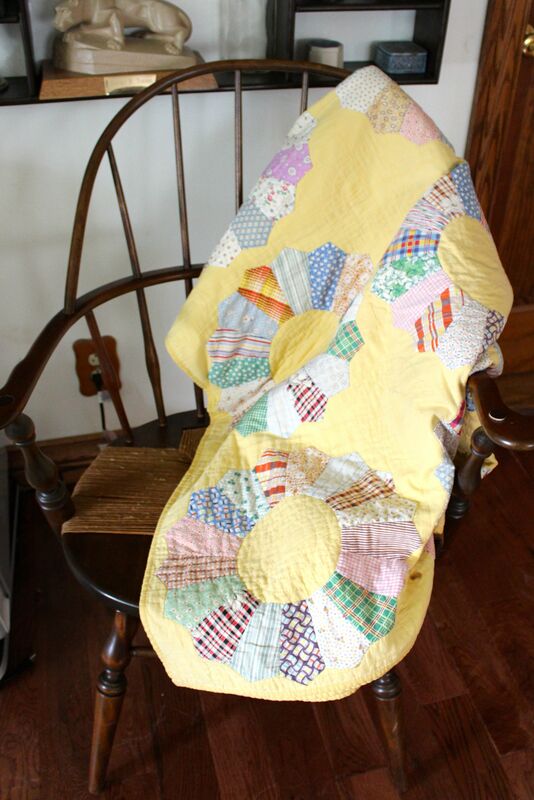 The quilt is from the 1930s or‘40s, all hand stitched, in great condition, and cost $3. It’s one of my favorite garage sale items ever. I got three of these redwood deck chairs for $1; yes, that’s 33 cents each! I love the vintage style and how sturdy they are. At Target, they sell set of 3 Pyrex mixing bowls for about $14. I buy mine at garage sales for no more than $1 each. Cast iron skillets? A couple of bucks. Coffee makers? A couple of bucks. My favorite iron (and I know irons!!)? A dollar. And don’t even get me started about vintage linens! I regularly find hand-crocheted afghans, tablecloths with stunning embroidery, napkins monogrammed by hand for a hope chest, all for a fraction of what they are worth. How do you even put a price on the kind of handwork and soul that went into making such things? I’m not trying to talk you all into become garage sale sleuths and flea market mavens. Rather, I’m trying to provide some insight about what makes the sleuths and mavens tick. And to let you know that you can get the same quality, for very good prices, on venues like eBay and Etsy. You might even find something you like among my treasures! It isn’t just the bargain—I could find bargains at T.J. Maxx or Kohl’s but you couldn’t pay me enough to go into either one. I hate traditional shopping. It isn’t just the quality—it’s easy to find quality, if money is no object. It’s the combination of finding something fabulous, and old, for a pittance, getting that jolt of knowing you got something you needed (even if you hadn’t known you needed it!) for next to nothing or much less than it’s worth. How about you? Can you relate? What’s your best coup, in terms of scoring both cost and quality in the vintage world? I’d love to hear your stories! How does one little song become so pervasive in the course of human events and, more importantly, why this song? Think of all the songs and all the candidates for immortality—why does one song get forgotten and another transcend its moment? The song “We Shall Overcome” has stood the test of time and cultural meaning. It has been sung as a message of protest and hope, by dramatically different groups of people, for at least 65 years and probably much longer. By focusing on changes the song underwent and its place in the American civil rights movement, I hope I can provide some insight about how and why the song has achieved such iconic status. The song came to mean so much to the African-American community for several reasons: its history, the way the specific words resonated, and because the act of singing together has power of its own. “We Shall Overcome” was an old song, with roots and meaning in the community. The civil rights movement, to be successful, had to bring together supporters from all walks of life. College students needed to able to work with and communicate with unlettered sharecroppers. Young needed to communicate with old, North with South, black with white. One way activists could bridge these gaps was through the use of old songs that everyone knew and related to. While some of the younger activists resisted the singing of spirituals and songs from “the bad old days,” others seem to have realized it was a way to reach out, not just to older African-Americans, but to all kinds of people who would find the music engaging and appealing. The use of these songs also built on past tradition and created a sense of community with those who had come before. African-Americans had been using song to deal with adverse conditions since the time of slavery, and the songs of the civil rights movement were a continuation of that resistance. Singing the old songs placed the singers within a tradition of singing and gave them the sense of building on, extending, the deeds of their ancestors. The deceptively simple words of the song are the source of much of its power. The changes made in the song, as it evolved, give us some insight to what people wanted and needed from the song. The song seems to have originally been written as “I will overcome.” This made sense if the song was to be sung as a hymn or in a religious context–“I will overcome my sins” or my baser instincts or whatever. In the context of a social movement, however, with protestors singing the song as a group, the needs changed. One hundred people singing “I will overcome” might ultimately come down to a meaning similar to that same group singing “we will overcome,” but the point was that no one person could succeed or bring abut the change needed without the group. The group, as a group, was necessary for change to occur. The “power in many” made a difference. The original song was also subtly different than the song the world came to know in the use of the word “will,” rather than “shall.” It seems such a little thing but think about the words—do they communicate differently? I’d say yes, emphatically. To say “will” simply expresses an intention. “Shall” carries extra weight and force. We associate the word “shall” with the language of law, regulations and directives and to express that which is mandatory, or inevitable, “Shall” also has Biblical overtones and a sense of determination that is missing in the use of “will.” And, because we tend not to use “shall” in everyday talk, it attracts attention when it is used and gives a special sound and power to the statement. What about the word “overcome,” though? Some would argue that that word was too strong and would sound threatening to listeners. In a context where white America was uneasy about thousands of African-Americans coming together to protest, would their use of “overcome” sounds too confrontational and off-putting? I’d argue that the word “overcome” worked because, in fact, it is not a word likely to evoke fear. When we use the word “overcome,” we tend not to use it to talk about overcoming people. We’re more likely to say, “I need to overcome my weaknesses” or “overcome the odds against me.” The word “overcome” is ambiguous in the best possible way and suggests a rising above or transcending of difficulties rather than violence. This, combined with the fact that the song did not ever refer explicitly to enemies or the “other,” meant the song could be sung with sounding combative. And the activists said that, even though they WERE afraid, when they sang, together, that they were not, it helped them address and overcome their fears, together, and continue their activities. In addition to the group history with the song and the power of the individual words the act of singing was critical in the success of the civil rights movement. “We Shall Overcome” and the other freedom songs were sung in unison, not by a performer singing for others. Everyone present raised voices together, making a big, powerful sound that had to be reassuring to anyone fearful about repercussions. This act of raising voices together built an actual, tangible community, where each voice mattered to the overall sound. Additionally, every singer, in singing, voiced a commitment. Humans truly believe that the voicing of a commitment makes the commitment stronger and “real.” If we didn’t, why would we ask couples to say, “I do” at a wedding, or ask a president to speak the Oath of Office? When activists sang, they made an oral commitment to the cause at a higher level. When people sang together, as in the civil rights movement, differences among them could be transcended. When, together, they sang “we,” they created an “us.” Given the magnitude of change they were looking for, this sense of community was a necessity. The singing of “We Shall Overcome” became ritualized in ways that took this sense of being part of something big even further. When this song was sung, at the beginning and ending of every meeting, it took on the power of a benediction. Activists stood next to each other with shoulders touching and held hands with right arm over left, swaying in time with the song. The ritual was theirs and, like any ritual, created a sense of belonging and group identity. Lastly, singing in general gave the activists an outlet through which they could take a stand and make themselves heard while remaining committed to the primary strategy of the civil rights movement, that of nonviolence. When faced with violence, they sang. When faced with angry dogs and knocked about with fire hoses, they sang. In the oral histories from the civil rights movement, you can find numerous references to the times when, faced with abuse and violence, protestors found the strength to “turn the other cheek” through their songs. I could go on and on (I already have!). “We Shall Overcome” worked in the civil rights movement, and continues to work for other protestors and activists and people in difficult times, because of its history—it is connected to past struggles and successes. The specific words matter very much—they are firm and clear, but nonconfrontational, and adaptable. The physical and communal act of melding ones voice with others connects people and offers both reassurance and power. The many strategies used by civil rights activists provide a virtual game plan for protestors in later movements. The song has connected thousands, bringing them strength and courage; right now, someone, somewhere is singing it. If you wonder about my credentials on this subject, let me reassure you. I spent my academic career studying the rhetoric of protest music. For much more on the topic see Kerran L. Sanger, “When the Spirit Says Sing!”: The Role of Freedom Songs in the Civil Rights Movement. New York: Garland Publishing, 1996. 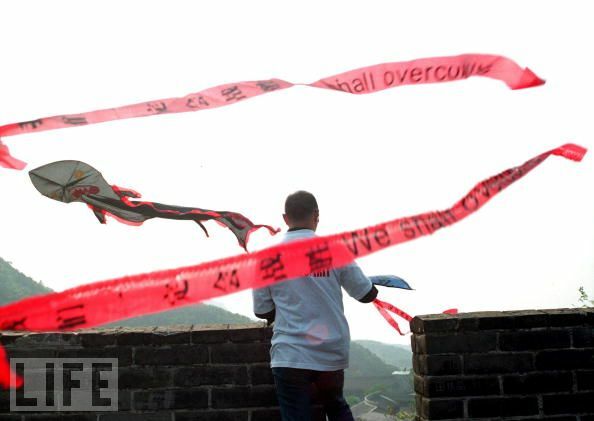 That we shall overcome, someday. With the 50th anniversary of the March on Washington for Jobs and Freedom and Martin Luther King, Jr.’s, iconic speech, “I Have A Dream,” our thoughts return to the American civil rights movement. Above all else, the civil rights movement was a people’s movement. You can talk about the leaders—the Martin Luther Kings and the Ralph Abernathys and the rest. They were important but the most important folks in the struggle for civil rights were just that, the folk. Many, many regular people, struggling in day-to-day life, but ready to take their chances and stand up for freedom. One of the means by which these regular people communicated with each other, and with the world they were trying to change, was by singing. The so-called freedom songs, including “We Shall Overcome,” provided them with a way to express hopes and fears, to communicate about aspirations, and to present a unified and peaceful image of the community. These songs were not presented by an expert singer to passive listeners; the freedom songs were, fundamentally, songs meant for singing, and everyone sang. “We Shall Overcome,” a song we so associate with the civil rights movement, had been used, in varying forms for many years before. In doing research on the song, I found many sources that said that the first version was written as “I’ll Overcome Someday,” by Reverend Charles Albert Tindley, in very early 1900s. But others, including Pete Seeger and Bernice Johnson Reagon, seem to believe that the song was much older and that Tindley adapted it and set it in print. Either way, the song was originally sung in churches with verses that said, “I’ll be all right” and “I’ll see the Lord someday.” (It should be noted that others have made claim on the song as well). By 1945, the song was clearly being used politically, to bolster the nerves of singers as they sought change in their lives. 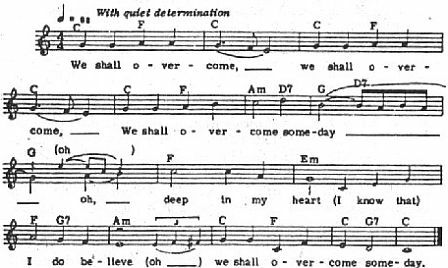 Picketers sang the song during a strike by black tobacco workers in South Carolina; instead of “I will overcome,” the words by then had been changed to “we will overcome”—a significant alteration. In 1960, a leader at Highlander, Guy Carawan, began teaching “We Shall Overcome” to civil rights activists, who taught it to others at mass meetings. The SNCC Freedom Singers began singing the song as well and very soon the song was considered the anthem of the movement, the one song out of many that seemed to best express the thoughts and feelings of the activists. The singing of “We Shall Overcome” became ritualized in many ways. Meetings began and ended with the song. Participants stood next to each other, with shoulders touching. They held hands, with right arm over the left, and swayed with the music. And everyone sang. This was not a performance but full-voiced participation. 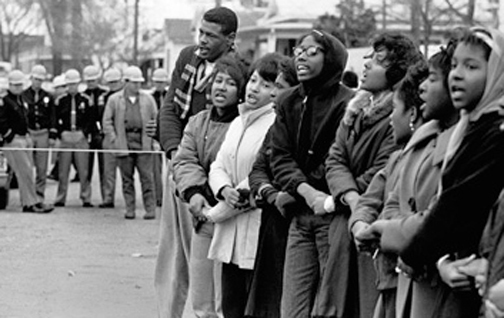 By March 15, 1965, the civil rights movement was undoubtedly changing. Deadly racial violence flared up, as African-Americans were attacked by police while preparing to march to protest voting rights discrimination. After these attacks, President Johnson called for Voting Rights Act, to enforce the right to vote, and he used the words “we shall overcome” in his speech. As the tenor of black protest changed in the mid to late-60s, the singing voices went quiet. But that was not the end of the story of “We Shall Overcome.” Unlike most of the other songs of the civil right movement, this one transcended that situation and has continued to reassure and galvanize singers around the world ever since. The words and song have shown up in Indonesia, Beirut, East Berlin, South Africa, Egypt, Tiananmen Square, all through Latin America, and all over the United States after September 11, 2001. Versions abound on Facebook and YouTube. And, of course, the 50th anniversary of the March on Washington has brought the song to our attention again as well. That’s the basic history of one song. The larger question, though, is how does one little song become so pervasive in the course of human events and, more importantly, why this song? Think of all the songs and all the candidates for immortality—why does one song get forgotten and another transcend its moment? If you care to stop back tomorrow, I’ll share my thoughts on that subject! That’s the Thing with Handmade . . .
That’s the thing with handmade items. They still have the person’s mark on them, and when you hold them, you feel less alone. To read my blog, and much of what is written about the handmade and hand crafted, one might reach the conclusion that the only “loving hands at home” are female hands. It’s time to challenge that thinking and start talking about the men who make beautiful things as well. While crafting often seems to be associated with women, we can find lots of examples of beautiful work, in many different media, done by men. And we should encourage it—why should women have all the fun and satisfaction? It’s not surprising or unusual to find men working in wood and metal and clay. A museum of folk art, like the Shelburne Museum that I’ve mentioned elsewhere, has many examples of furniture and metalware, like weathervanes and hardware, made by men. It’s less expected to see men’s work in the textile arts. The weaver’s trade was historically a male-oriented art, at least in some cultures, but work with textiles seems, now, to be heavily associated with women. And yet men are just as capable of beautiful, expressive hand-wrought work as women—so why don’t we talk about it more? I’m going to and I’ll start at home! 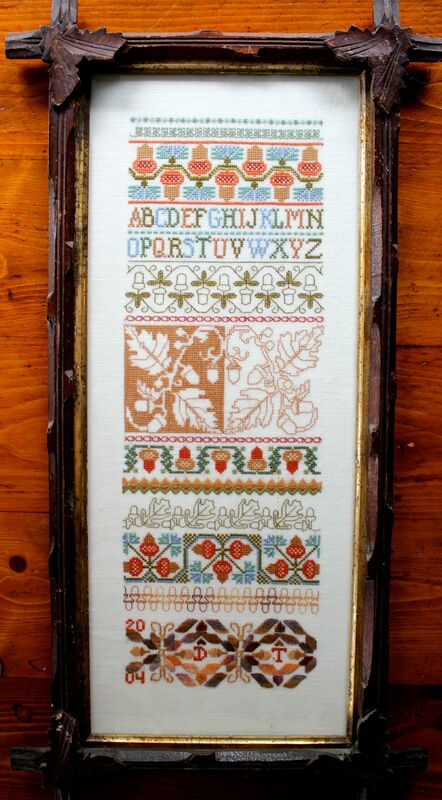 My husband has been making beautiful cross-stitch samplers for almost 25 years. It all began in the early 1990s, when I started to make quilts. 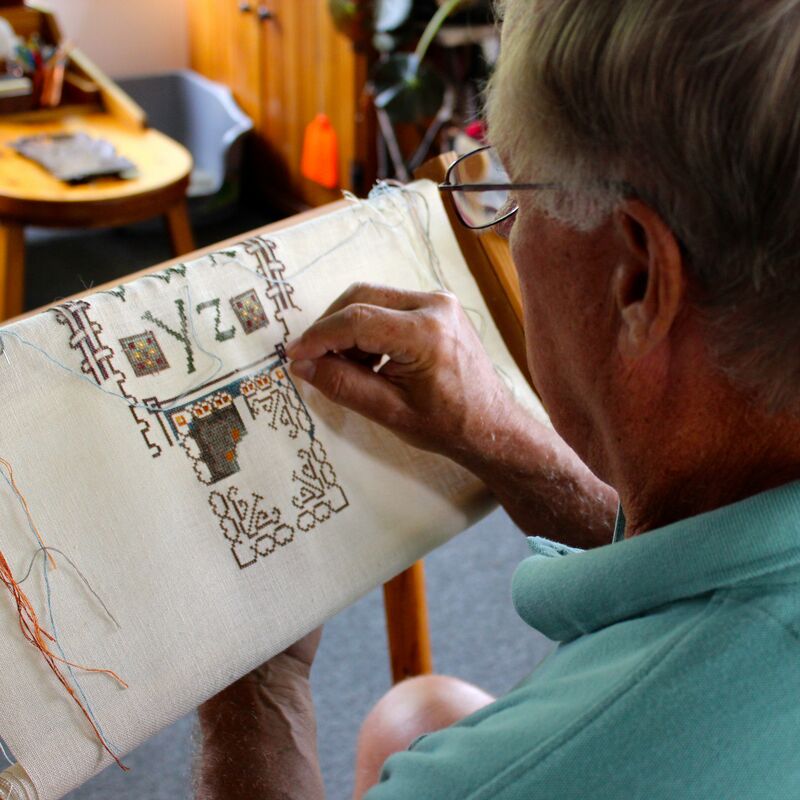 My husband, Don, was drawn to the craft, the colors and patterns, and wanted to jump right in and work with me. What he found was that, with his big guy hands, he had trouble making the tiny stitches needed for piecing the patches and for hand quilting. But he wanted something creative to do while I quilted. A trip to Colonial Williamsburg found him pondering old stitch samplers. The gift shop sold cross-stitch kits and, on a whim, he picked one up. And the rest, as they say, is history! When he finished that design, he went looking for a new pattern. We went to an embroidery and quilting shop, where he picked out a pattern that looked more advanced. All the women in the store gathered around this guy who was, of course, the only man in the shop. “Oh, you’re going to make that one! 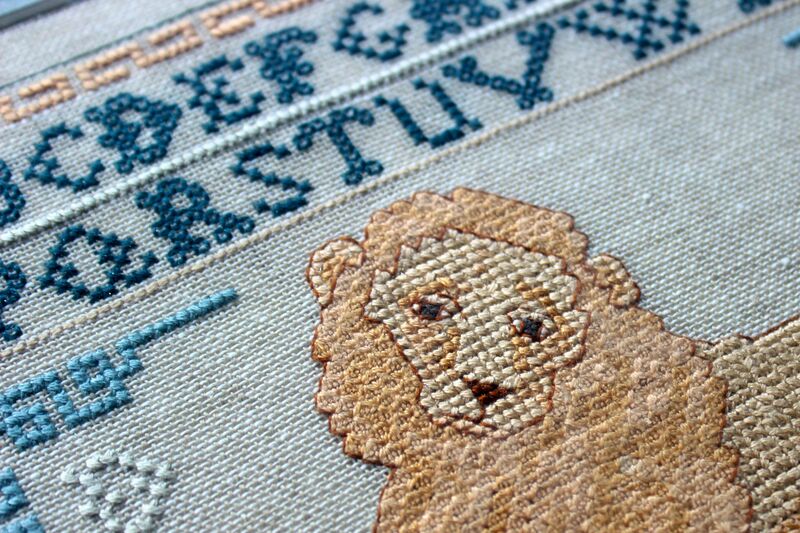 How much cross-stitch have you done?” they asked. “One project,” he answered. Stunned silence. And a dozen women’s voices, all at once, trying to talk him out of it. To talk some reason into him. They said he should choose a different pattern and go slower and work his way up to the pattern he chose. But we’re talking about a man, here! A former Marine, with two tours of duty in Vietnam. A college professor who doesn’t know the meaning of self doubt. A guy who, just like all of us, hates to be told he can’t do something and wants to prove he can! So, of course he started that project and slogged through it. He pulled out a lot of stitches (and swore like a Marine every time!) 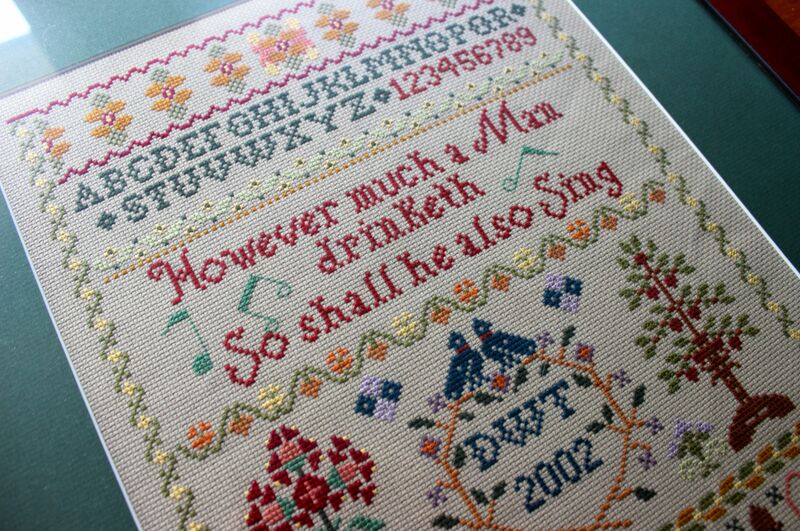 but he finished that sampler, perfectly, and has gone on to make many more. Our house is full of these beautiful creations, and other equally beautiful ones live in the homes of our family members. He has done marriage samplers and Christmas stockings for babies, all the kinds of projects one would expect from a pair of loving hands at home. I’d love to hear more about the men who make. Was your grandfather a furniture maker? Does your Dad have a craft? Does your significant other ever join in when you’re making something? Or are you a guy, yourself, who can tell us about what you make? Let’s hear it for manly, and loving, hands at home! A few days ago I began what will be a short series by asking, “Why vintage?” What is it about clothing and home décor and cars of decades past that appeals to people? The first reason I discussed was the fashion appeal of vintage design. Today I’ll talk about impulse to buy and use vintage because of a sense of ethics. What’s so ethical about vintage? Well, when you start to think about it, quite a lot. In a world with a lot of huge landfills, full of throwaways and discards, the idea of using what we already have appeals to a lot of people. I want to change the way people look at the ‘things’ in their life and get them thinking about how to reduce waste. I hope to raise awareness about the value that even broken possessions may still have and show that there are people out there who can make good use of ‘garbage.’ This increased awareness serves to reduce the amount of waste our society creates, which has many different benefits. Reducing waste is great for the environment. It means we have to mine less, manufacture less, grow less, and put less in landfills. The blog chronicles his finds, and their value, both in monetary term and in terms of the ways he and others make use of what someone else considered trash. Go look—you’ll be amazed at what he’s found! And it’ll make you wonder about what you’ve thrown away! Lots of people are recycling, repurposing, upcycling, just not to this extreme. And at least some of that behavior has encouraged a new look at vintage items that are perfectly good (and, in some cases, much better than we can buy now . . .but we’ll get to that later). You don’t have to open trash bags by the side of the road! I challenge you to go out to a few garage sales. Many of the garage sales you’ll go to will have full sets of dishes–some gorgeous china, some for everyday, all inexpensive. Every sale will have glassware. Pyrex dishes. Silverware. Salad spinners. And that’s just the kitchen stuff. When you think about it, doing a little home furnishing using vintage finds is the same impulse as adopting a pet from the SPCA, instead of going to a puppy mill. Many people say why not save a life? I’m one of these people. I’ve said that I don’t choose vintage because it’s fashionable but I do like the idea of using vintage as a way to reduce waste when old stuff will serve me well. But, don’t get me wrong—I like nice things! 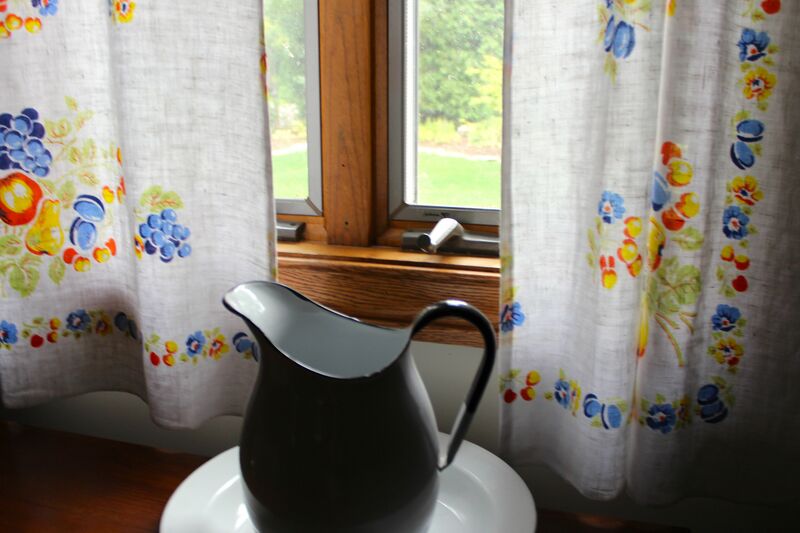 I get an enormous kick out of walking around my house and identifying the really nice furniture, and quality house wares, and gorgeous linens that came from garage sales and flea markets. Why would I use paper napkins (and throw them away), when I have dozens of elegant cloth napkins that can be re-used? And look good at the same time! And, like many others who are into vintage re-use, I “upcycle.” That’s an awkward new verb that means to take something old and turn it into something new, and maybe better. I think it’s a fun challenge to see what I can do with damaged vintage items, rather than throw them away. The curtains used to be a tablecloth with a BIG hole. 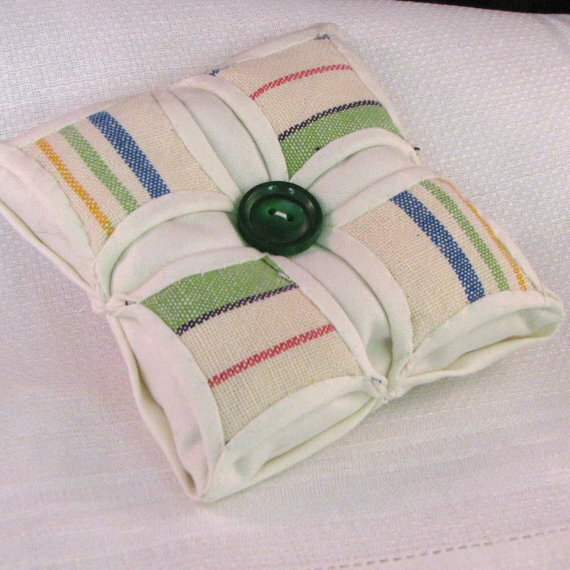 A cedar sachet, made with scraps of old dish towels. 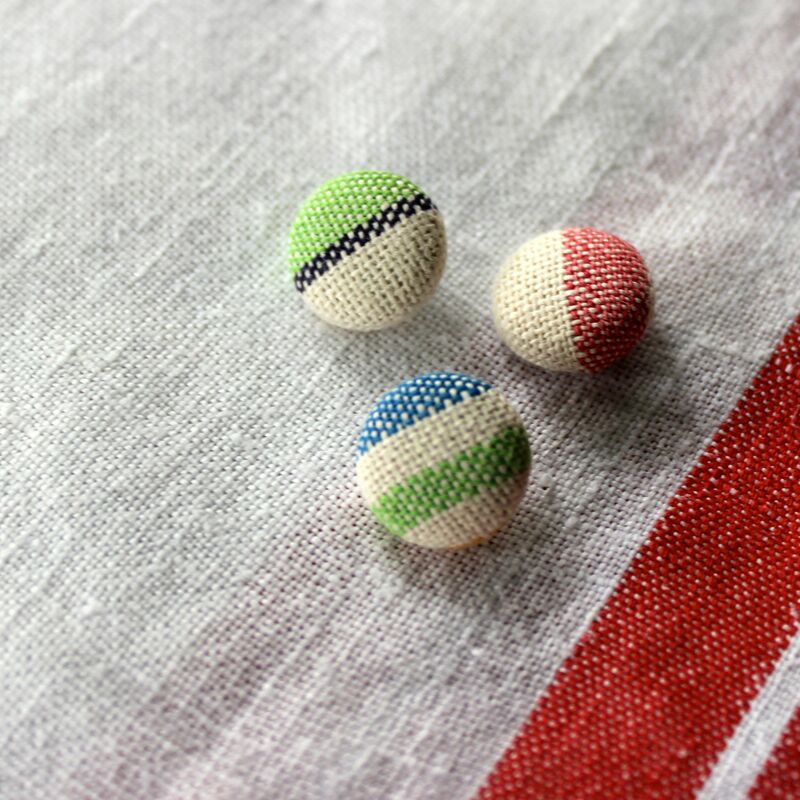 Not to waste a bit of a great towel, I covered buttons with more scraps! 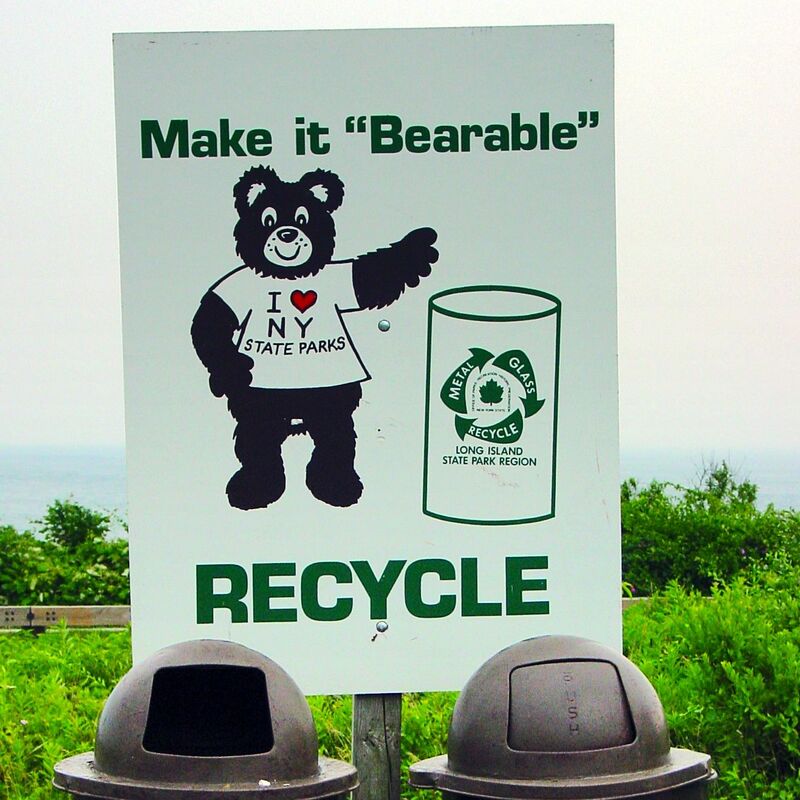 Now, of course, right at this moment in time, it’s fashionable to recycle and upcycle and go green, so the lines get blurred between my reasons 1 and 2. In our next installment, we’ll talk about how people also save money AND get great quality by buying vintage. In the meantime, ask yourself—are there ways you can (or already do) achieve the look you want while maintaining a commitment to wasting less and recycling more?